The problem—quite apart from any theological questions we might have with the premise—is that this level of urgency created three widespread reactions, none of them helpful. 1. Break your life into separate compartments. Some people, experiencing the ponderous weight of bearing the eternal destiny of another person on their shoulders, simply opted out. Instead of trying to find ways to be authentically Christian in their day-to-day lives, they compartmentalized. At church, they were Christian. At work, or in their neighborhood, or out on the town, they were something else. They had church friends who were separate people from their work friends or their neighborhood friends. It was too stressful to even consider the social cost of these significant evangelistic conversations. So they settled down into a kind of niceness evangelism and crossed their fingers that would be enough. 2. Become a Nag for Jesus. Other people, the ones who bought into the urgency of the prime directive, dove in headfirst. They became the Jesus Freaks, the ones who carried their Bible everywhere, always ready to give a Romans Road presentation at the first hint of a willing audience. Sometimes they were earnest. Other times the fear showed through. For a few, their newfound urgency became a kind of power trip. Almost always, though, they came off as annoying and intrusive, rather than loving. But what else could they do? They loved Jesus. They were desperate to save their friends. 3. Live with guilt and shame. Now, a whole Lot of Christians didn’t feel at home in either of these camps. They were sure that being a part of Jesus’ new kingdom should impact their everyday lives. Niceness is surely better than meanness, but it’s not specifically Christian! Compartmentalization seemed like a cop-out. On the other hand, they didn’t like the hard-edged, manipulative tone of the super Christian who only seemed capable of talking about heaven and hellfire. Something seemed off about turning your entire relationship network into marks for a multi-level marketing scheme hawking eternal life. Stuck in this tension, many of these Christians wound up trying their best to find ways to talk about Jesus, while carrying around a backpack of shame, always worried that they just weren’t measuring up to God’s standard. The prime directive could turn every interaction into a panicked, desperate bid to win a person’s soul in the least amount of time possible. To make it somewhat less awkward, there were scripts and diagrams, leaflets you could keep in the back of your Bible and—of course—Chik Tracts. OK. We’re all adults. Let’s be honest. Whenever there is something difficult to be done, the kind of motivation that produces results fastest is always fear. Fear was used to manipulate the targets of our evangelism. “If you die tonight, you don’t want to go to hell, do you?” That’s a threat of punishment, even torture. Fear was used to manipulate good-hearted Christians to evangelize. “How will you face Jesus if you know you didn’t tell your friends about Heaven and Hell?” That’s a threat of shame. Fear is an effective motivator. It can be life-saving at the moment. Over time, though, it is exhausting. Worse, it almost always twists the outcome of what we hope to accomplish. Fear can twist evangelism into a carrot-and-stick calculation, where what matters most is a person’s address in the afterlife. Fear can twist following Jesus into a never-ending religious performance, where we do our damndest, always anxious that God might boo us off-stage for a flubbed line. Fear turns faith into a desperate need for certainty. Hope is replaced with worry. Love twists into toxic attachment. So, exactly how do people get saved, then? 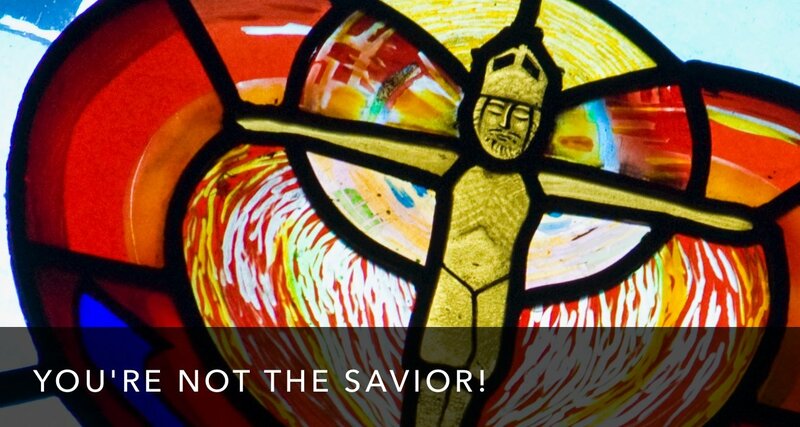 Christians can (and have) debated the exact nature of salvation and how people can experience it. Modern evangelical Christians tend not to know this. Depending on where and when you look in Church history, becoming a Christian included a surprising array of things. The list could consist of being baptized, agreeing with the Creed or another list of doctrines, and participating in a process of training. In some cases the training was short; in many cases, it was quite long, even years. Before allowing you to be baptized, some communities required that you make amends for past sins and crimes. Other churches required you to leave the military and vow to abstain from violence. (See this blog post) Almost all communities required some length of time in prayer and fasting before baptism, ranging from three days to three months! What you don’t find very often, until the last hundred years, are many examples of people becoming Christian over the course of a single, stressful conversation. Motivated by Love, Expressed in love. So, what does all of this mean for us? It means that instead of being driven by a motivation of fear, we need to look elsewhere. God’s motivation for reaching out to humanity is and always has been love (John 3:16, also see this blog post). Jesus, when he taught and interacted with the people around him, moved from a place of compassion, like a mother hen watching out for her chicks (Matthew 23:37) The Apostle Paul tell us that it is love that compels us (2 Cor. 5:14-15) in the way we interact with others and in how we live our lives. Most importantly, we are reminded (1 John 4:18) that fear and love are incompatible. Real love makes no room for fear; in fact, it drives fear away! If you’re feeling fear, reconsider. God already loves those people, your kids, your friends, far more than you ever could. God is already working in their lives through the Spirit drawing them to God’s self. You are not “the only Jesus” people around you will ever see. Don’t get your role twisted! You may indeed have a role to play. But that role will only ever be a role motivated by love, expressing love. It will never be driven by fear, expressing condemnation. Your love for God is the only motivation that will, over time, move you to live your life in alignment with God’s will. 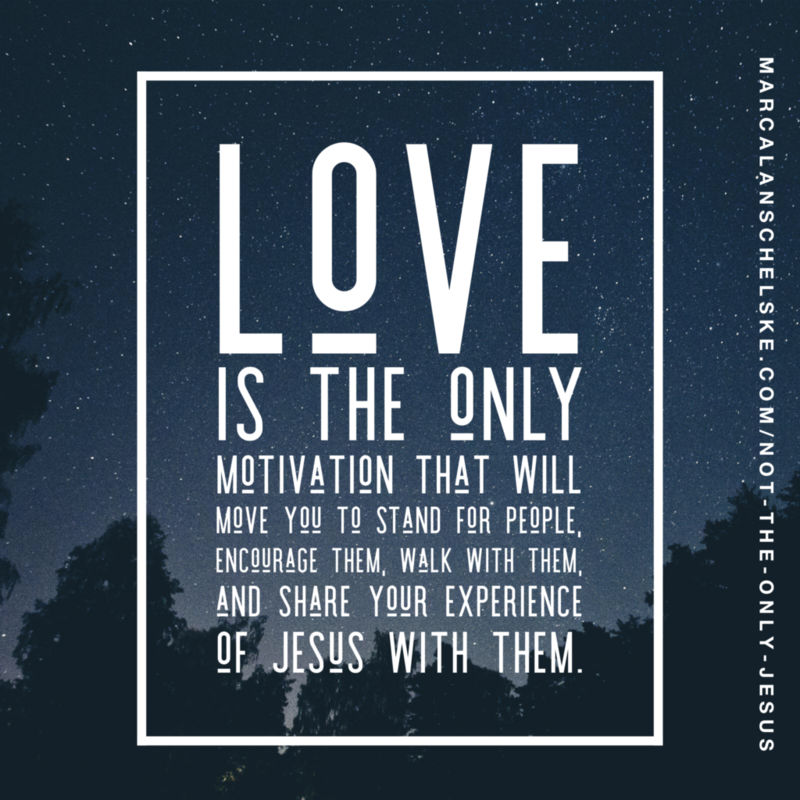 Your love for people is the only motivation that will, over time, move you to stand for them, to encourage them, to walk with them, and to share your experience of Jesus with them.